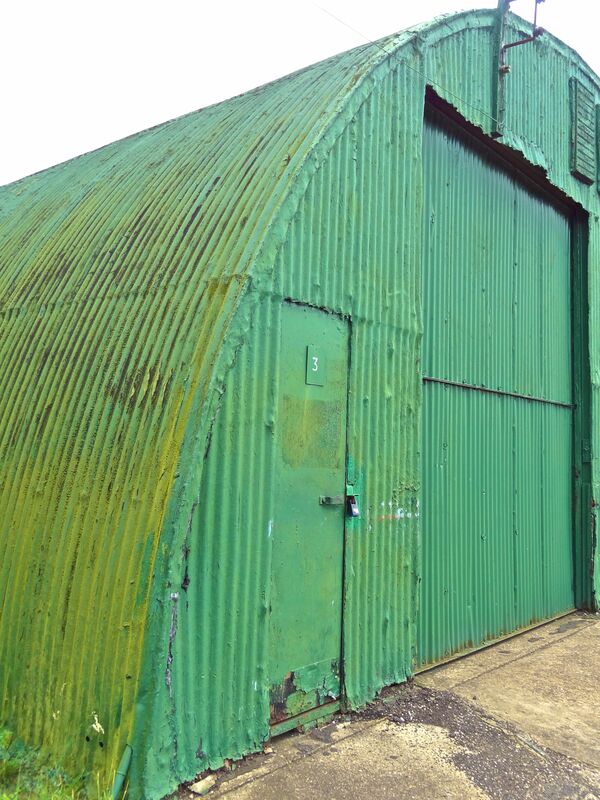 These corrugated iron building, now part of the the museum and workshop complex at the Buckinghamshire Railway Museum, have a fascinating history. They are a remnant of the secret side of Britain. 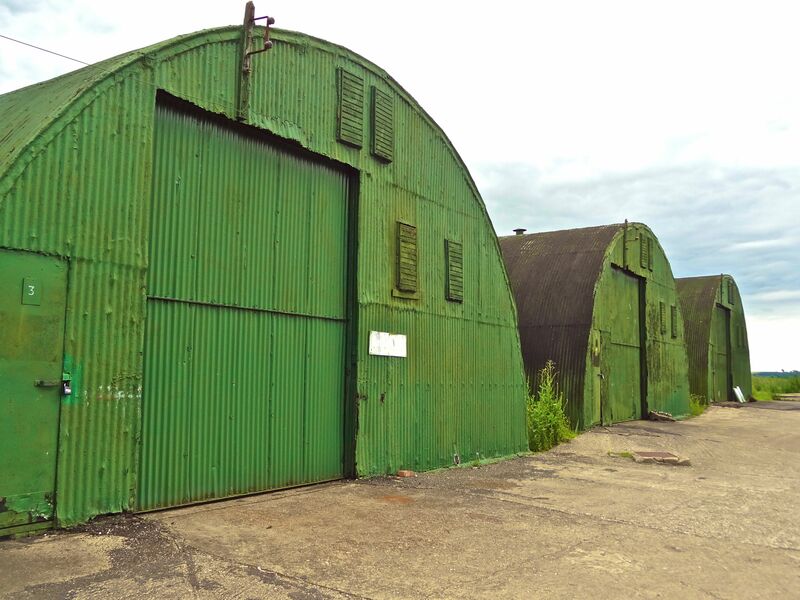 Several hundred Strategic Foodstores or Buffer Depots, exactly like these, were built across the country by the Ministry of Agriculture, Fisheries & Food (MAFF) during the Second World War, to store supplies in case of food shortages. At Quainton they were erected in 1941. By 1943 there were some 6.5 millions tons of food held in Buffer Depots across the country. 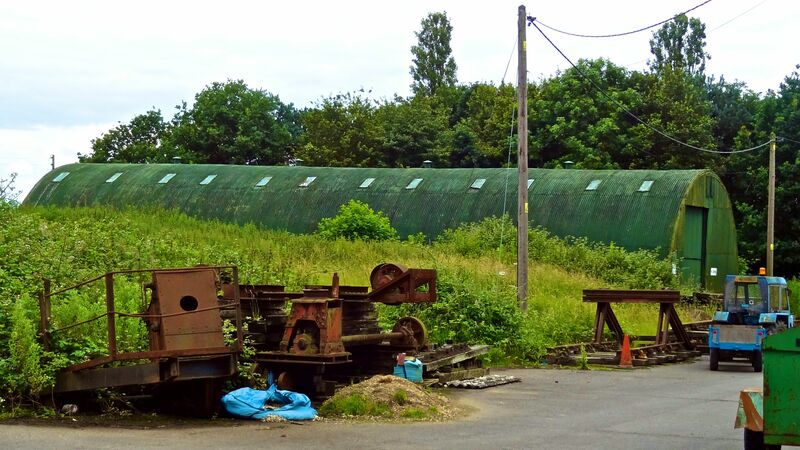 The Depots were built away from towns or other potential aerial targets, and next to a railway line, or canal, with good connections and good road access for local distribution. 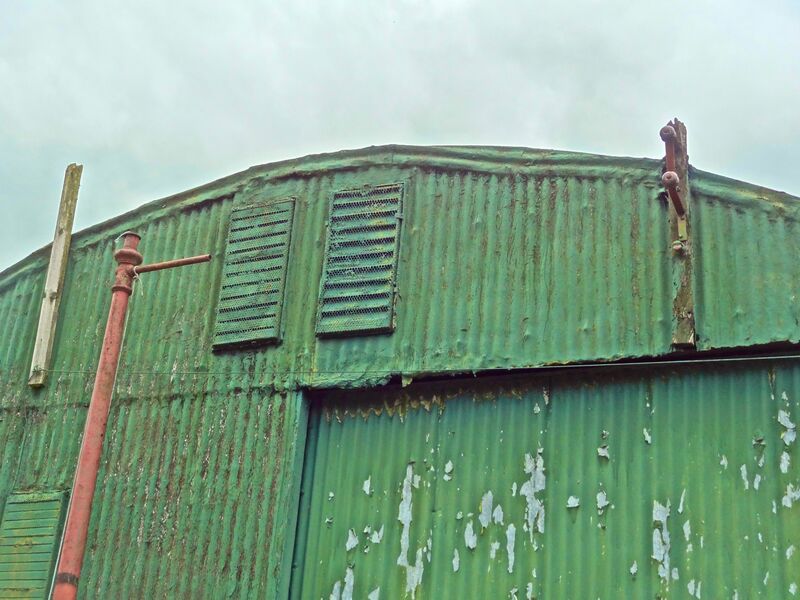 Each Depot had one large brick building where flour was stored on large pallets, and any number of Romney steel fabricated buildings, originally designed for other military use. 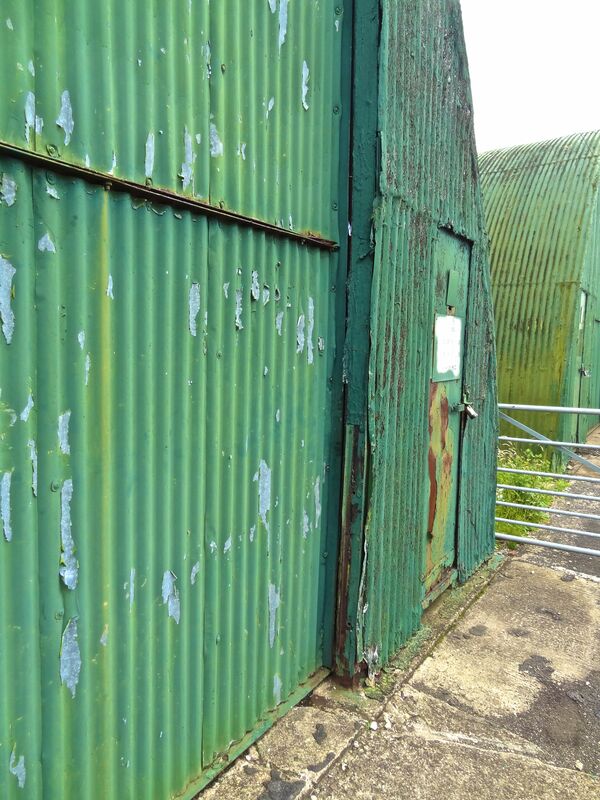 At Quainton these corrugated stores were filled with sugar and sultanas. Great care was taken to seal the roof and doors with chicken wire, to prevent rodents getting in. These stores continued to be used until the end of the Cold War in the early 1990s, with a regular turnover of contents transported by road. Plans and exercises from the mid-1950s predicted that in the event of a nuclear attack, the loss of raw materials, power and water together with physical damage and loss of workers would seriously reduce if not completely stop all food manufacturing and processing. There would also be no imports of food for months, and this would probably include importing food from another home defence region. Furthermore, the breakdown in transportation systems, communications and the economy in general would stop food moving to the shops. If food were available to the public they would struggle to cook it, without electricity, gas or uncontaminated water. 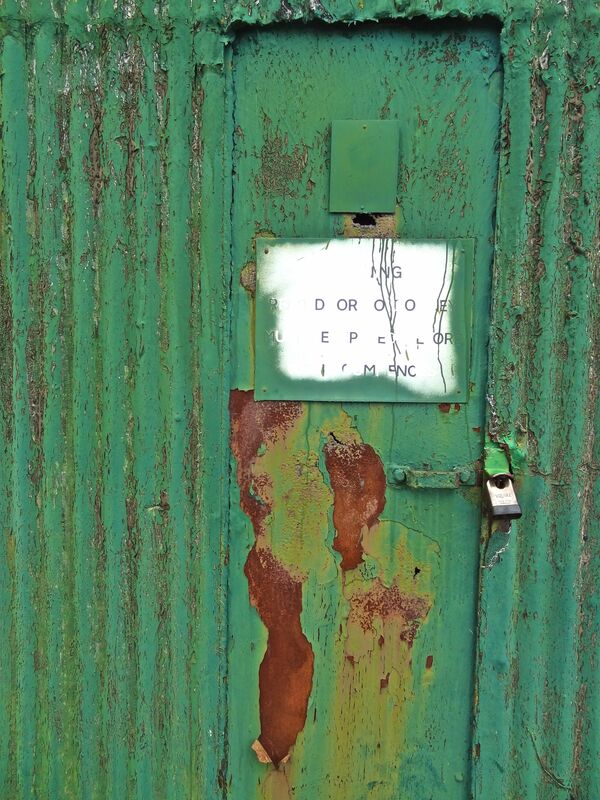 Such fears meant that the Depot had a long life as part of contingency planning, even in the 1980s regulations required local authorities to draw up plans for: Providing and maintaining a service in their area for the distribution, conservation and control of food in the event of hostile attack, including emergency feeding services and equipment. The responsibility for contingency planning for food supplies, as in the Second World War, remained throughout the Cold War with MAFF. In a period of crisis, MAFFs role would be to monitor the availability of food through its local Regional and Divisional Offices with the aim of ensuring the continuity of supply of food throughout the country. It would encourage manufacturers to increase output, increase its buffer stockpile, disperse bulk food stocks, set up its post-attack structure and possibly introduce the rationing system. From 1961 the idea of an immediate survival element of biscuits and boiled sweets was introduced. The wartime corned beef was sold off by 1967. With minimal funding being received from central government, storage costs were covered by gradually selling off the stocks and by 1971 only 402,000 tons remained. This total would have been totally inadequate to feed a survivor population, particularly when you consider in the 1960s it was assumed there would be some 40 million survivors who would need feeding for 3 months after which it was assumed food imports would be resumed. It was thought that normal commercial stocks would provide food for 33 days and the strategic stockpile would then provide an additional 23 days supplies. There were frequent calls from MAFF to increase the stocks by up to a million tons to cover the shortfall, for example in 1969 a MAFF report advised that “…current arrangements for food supplies in the UK in the aftermath of nuclear war are inadequate to prevent widespread starvation” but with the continual absence of money for civil defence measures these concerns fell on deaf ears. Remarkably, it still wasn’t until 1991 that the decision was finally made to dispose of the remaining stockpile of around 200,000 tons of food still held in the Buffer Depots. 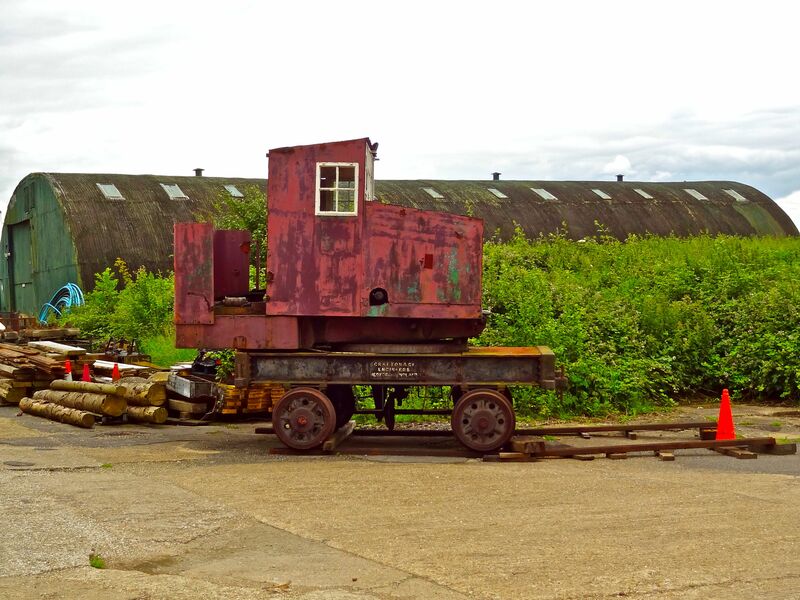 The Quainton site was acquired from MAFF in 1997 and adapted to house railway carriages and wagons. Scarily we now don’t hold any food stocks, other than what supermarkets hold in distribution, and almost all food is imported ‘just in time’. In the event of something major happening with the fuel distribution chain, which seems entirely plausible given the state of most of the fuel producing nations, we’d be in trouble pretty quickly. Back in those days we didn’t import much food either, so I suspect the situation would be much worse if it happened now. As someone that lived in the next county to this facility at Quainton & have visited it since childhood. I also was an active civil defence volunteer in the 80s at a very basic community level. 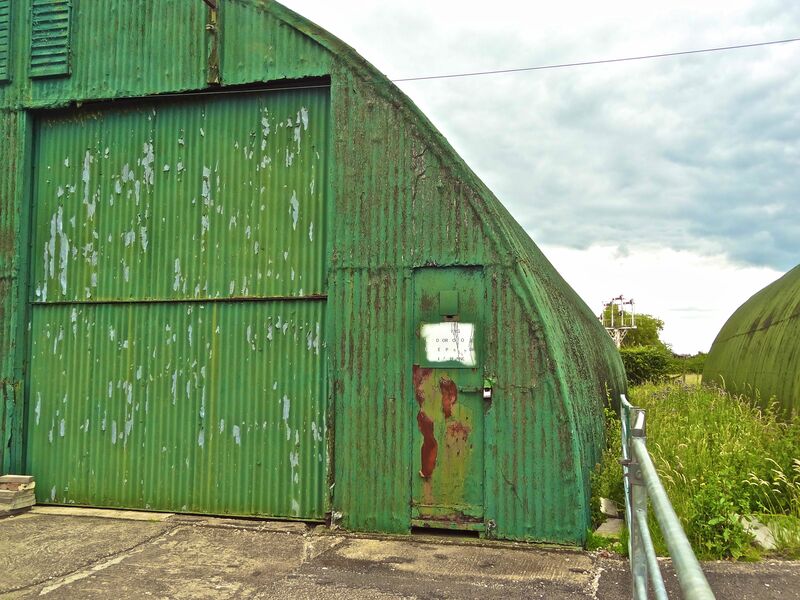 It was mentioned that we should rely upon the chain of such depots which built during WW 2. They were ALWAYS located next or close to the railway system & in some cases canals (Quaintons neighbour at Tring, which was my own local one holding 70 tons of [Argentinian] corned beef, except after 1982 it came from a little known town in Paraguay called Frey Bentos!). The MAFF Emergency Planners has also arranged with MOT (railways) to allocate 10 deep water bays that could take ocean going cargo vessels, each bay had a serviceable railway spur. This was to allow alternate port facilities (of sorts), to function IF the main ports were nuked. How the civil servants could envisage getting manpower, port workers with suitable trade backgrounds (i.e. Stevedores) to function after such an aftermath, is really beyond peacetime thinking. But the one main area that the UK did not consider planning for, in the aftermath of a nuclear exchange would be importation of oil & other fuel products. But food would’ve been as valuable from overseas & how many former colonies, et cetera would’ve risen to the crisis demand after many years of political neglect of them by the same former colonial power. The replier who commented on the sheer short time window supply chain is NOT wrong. Since my volunteer days, I’ve worked for a large supermarket chain in a distribution depot which covered a fair amount of London & the SE of England. I know from holding coffee break chats with senior depot management, they assured me that that line of supply window was upto 72 hours in the early 80s. Today it has now dropped between 12 to 6 hours, dependent upon producer & food processors supply capacities. When the fuel protests of late 2000 hit such supply operations, supermarkets noted that both bread & toilet paper where running out fast. Then the Foot & Mouth outbreak, saw a wide range of tinned & longer term storage processed foods being sold faster. But remove something as basic as road diesel (DERV) from this whole equation, & inside 4 hours the 1st shortages WILL SHOW UP. [After the media go public]. I can honestly state that anyone thinks that either of us is rabble rousing or being slightly paranoid, should spend some months working in these places & see how a tiny incident CAN have a potent domino effect in minutes. Inside less than 1 hour, it can bring the whole floor to a grinding halt. It is at this stage that I pity all those “Zero Hour” contracted workers. But what is really bad, not until you drive into your out of town supermarket shop, to enquire as to why so many shelves have sudden emptied & not be restocked! THEN you can figure out, whose paranoid! Next Next post: Wonderful Kings Cross!